For what seemed like years, it was turkey every day, for almost every meal, in the Bacon household. 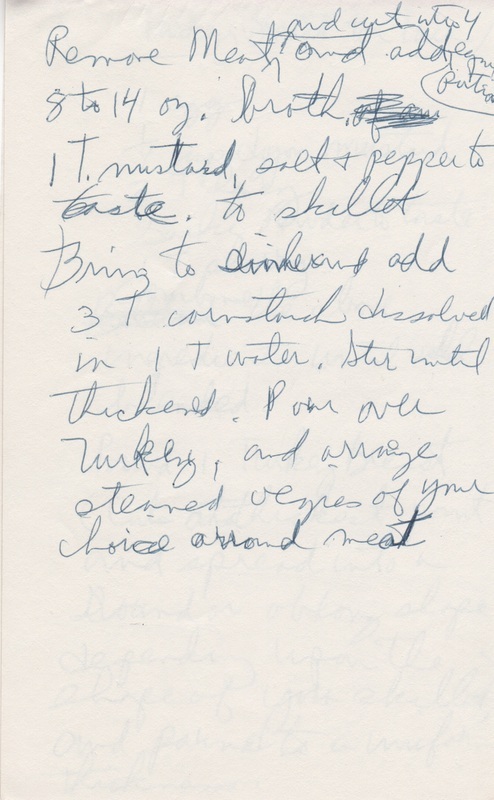 In the mid-70s, Lisa became fascinated with exploring turkey meat as a potentially versatile meat that was "not just for Thanksgiving anymore." With the help of "Ray" the local butcher who owned Ray's Gourmet Meats in Northridge, CA (Motto: "Our meat is so tender it's a wonder the steer could walk!") she learned how to skin, de-bone, cut, grind, and filet a whole turkey, long before ground turkey meat and turkey parts became a regular part of the American diet. Not one bit of the turkey was wasted. The neck was used for soup stock meat, or often seasoned and slow roasted into crunchy perfection for her children to "gnaw on" when they got home from school. The skin became the casing for a delectable rolled turkey entree, and the liver, gizzard and heart was used for the classic gravy, or ground into a savory pate. 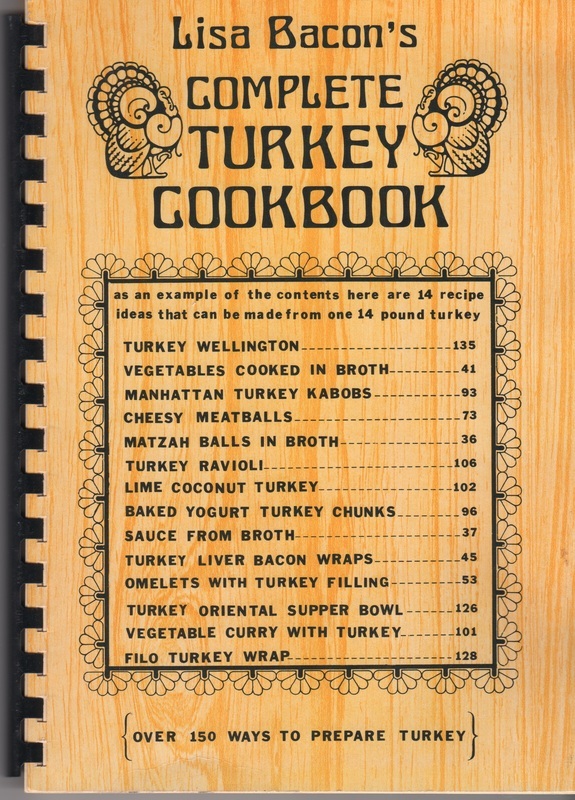 "Have any unsightly meat defatted and ground" she suggests in chapter one, "It is really fun to see how many meals you can plan from a boned turkey and if you thrive on variety this meat supplies more flavor and eye appeal than hamburger. It also costs less per serving when used in recipes calling for cutlets, stew pieces, etc. You will find meals for breakfast, lunch, dinner, and any time within these pages. This book is only an eye opener for you. Have fun exploring on your own by simply substituting turkey for any meat or poultry called for in your own recipes." She delighted in tricking her family time and time again by stating that she was serving pork, beef or chicken, when she was actually serving turkey. Depending upon the cut of meat, how it was cut, and how it was cooked, she could make turkey taste like any number of meats. After years of researching and creating recipes, her daughter Summer diligently illustrated and hand typed the homespun cookbook (no computers online publishing options back then), and with the help of her husband, Ron, had 500 copies printed. Not long after, a local health food store in Northridge, CA, purchased two cases of the books for sale in their store. They sold well until one customer complained about a teaspoon of sugar being used in a recipe, and Lisa's books were taken off the shelf. 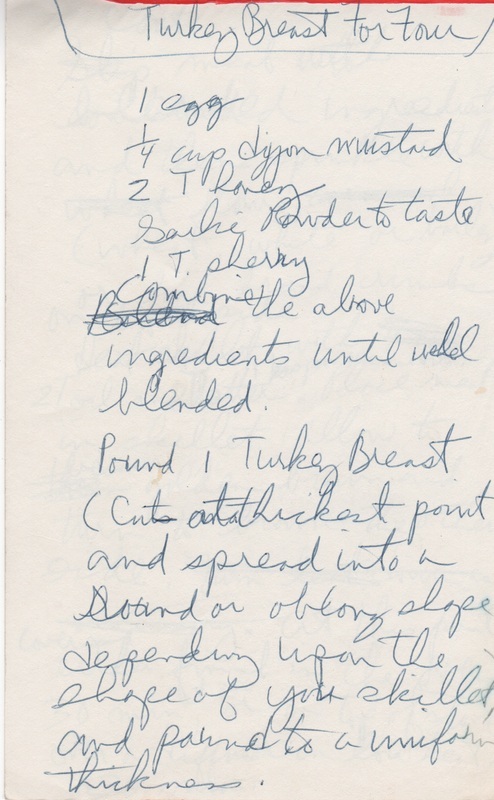 Ironically, even after her books were removed fem the shelf, some of Lisa's recipes, including Turkey Salad with Persimmon Sauce (recipe shown below), showed up in flyers that were stationed at the meat counter for promotions at this store. The flyers gave no credit to Lisa or her cookbook. The experience was devastating for Lisa who subsequently engaged in a half-hearted legal battle with the store. It was "half-hearted" because of Lisa's non-confrontational nature. Eventually, pressured by high-dollar attorneys and the prospect of months and maybe years in and out of court, she accepted a small out-of-court settlement. The health food store was eventually acquired by a chain. In 2014, Lisa's daughter, Summer Bacon, discovered a letter in Lisa's own hand, that was never delivered to her attorney. It described the emotions and heartache that she felt around the whole legal situation, and her crushing desire to be acknowledged for the innovative cook that she was. Arrange the lettuce, turkey and grapes on individual serving plates. Place the sauce ingredients in a blender and mix, using high speed. Pour over salads. 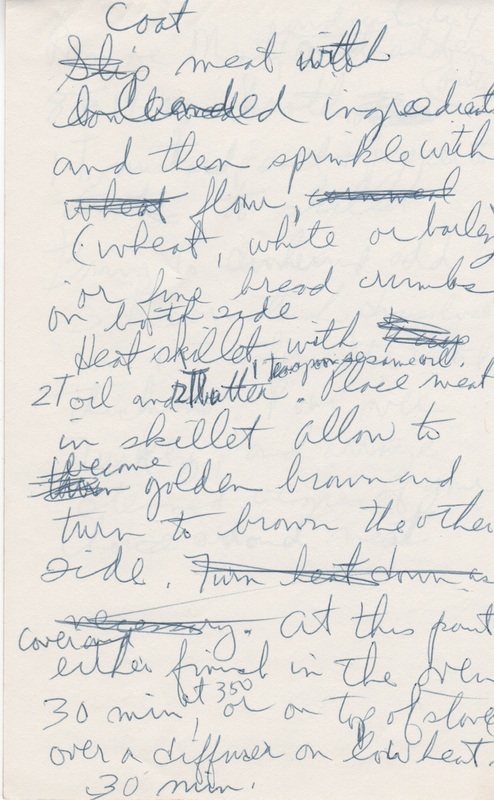 *From Lisa Bacon's Turkey Cookbook, ©1979 Lisa Bacon • All rights reserved.